academic ideas and commercial development"
"High Efficiency Clean Fuel Production From Carbon Dioxide and Water Using Solar Energy at High Temperatures"
...Within a year of recieving an I-SAEF grant, Professor Karni's team demonstrated a laboratory proof of principle. As a result, his project was able to attract significant commercial interest and resulted in a multi-million dollar private investment to further develop the project toward commercialization. "Catalytic Materials and Process for Hydrogenation of CO2 to Liquid Fuels"
A replacement for oil has become a burning need in the 21st century. BGU researchers have invented a process to make a green feed alternative for crude oil out of two of the most common substances on Earth – water and carbon dioxide, which is a greenhouse gas detrimental to the environment. Prof. Moti Herskowitz (pictured above), Prof. Miron Landau, Dr. Roxana Vidruk and the team at BGU’s Blechner Center for Industrial Catalysis and Process Development have developed a green feed that can be converted using well-established technologies into liquid fuel and delivered using existing infrastructure to gas stations. As opposed to other alternative fuel sources, such as electric cars, which require additional infrastructure, this green feed would merely replace oil as the input for refineries. 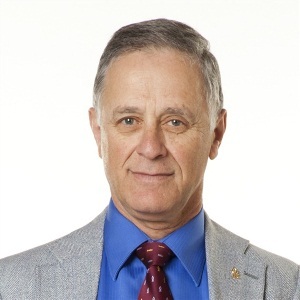 Herskowitz, the incumbent of the Israel Cohen Chair in Chemical Engineering, is also the VP & Dean of R&D at BGU. The process is patent pending, “and we are ready to take off,” demonstrate and commercialize it, asserts Herskowitz. Bench experiments have been conducted and scale-up should be relatively simple, he says. Herskowitz will unveil his revolutionary breakthrough at the Bloomberg Fuel Choices Summit in Tel Aviv on Wednesday, November 13th. “It is an extraordinary challenge to convert carbon dioxide and hydrogen to green feed,” he says, “The technology is based on novel specially tailored catalysts and catalytic processes. Well-established, commercially available technology can be directly applied to the process developed at BGU. It is envisaged that the short-term implementation of the process will combine synthetic gas produced from various renewable and alternative sources with carbon dioxide and hydrogen. Since there are no foreseen technological barriers, the new process should become a reality within five to ten years,” he says. Regarding other alternative fuels, Herskowitz maintains that his invention represents a game-changer. “The liquids that have been used over the past decade are ethanol (alcohol), biodiesel and/or blends of these fuels with conventional fuels, as will continue to be done in the foreseeable future. These alternatives are, however, far from ideal, and there is a pressing need for a game-changing approach to produce alternative drop-in liquid transportation fuels by sustainable, technologically viable and environmentally acceptable (in terms of GHG emission) processes from abundant, low-cost, renewable materials,” he says. The Blechner Center for Industrial Catalysis and Process Development has a proven track record of commercializing applications from its basic research. It developed the Aleol product line of fine aroma chemical products which Makhteshim-Agan has set up Negev Aroma at Neot Hovav to produce. The Blechner Center for Industrial Catalysis and Process Development, founded in 1995 has developed the infrastructure and the expertise required to deal with a wide variety of challenging topics related to basic and applied aspects of catalysis and catalytic processes. This was accomplished with major funding of well over $14,000,000 from various sources such as science foundations and industrial partners. The Blechner Center played a key role in the Center of Excellence funded by the Israel Science Foundation, participated in three different programs of the European Framework Programs and is part of the I-CORE program in renewable fuels. Researchers at the Blechner Center have developed a novel process for converting vegetable and algae oils to advanced green diesel and jet fuels and a novel process for producing zero-sulfur diesel. This project is partially supported by The Israel Strategic Alternative Energy Foundation (I-SAEF).